Many counselors and specialists use cognitive behavioral therapy (CBT) to treat alcohol and drug addiction. CBT involves many methods, some of which counselors combine to get the best results. Learn about this type of treatment and some of the cognitive behavioral therapy techniques that clinicians use. In the 1960s, Dr. Aaron T. Beck developed cognitive behavioral therapy as a way to prevent addiction relapse. Doctors first started using the therapy to help alcoholics. Later, they adjusted this approach for people who are addicted to drugs as well. 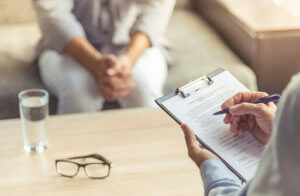 The basis of cognitive behavioral therapy techniques is that learning processes play an important role in the development of substance abuse. CBT teaches those with addictions to detect and correct bad behaviors. They also learn to address other mental or physical health problems. A central part of CBT is predicting problems and improving self-control with coping strategies. The purpose of this method is to help those in recovery test their own thoughts. This type of approach involves patients giving themselves negative and positive feedback for various actions to see how they react. For example, they can discover whether they’re less likely to relapse if they practice self-kindness or self-criticism. The patients monitor their reactions after using this method in different scenarios. It could help counteract the thought that self-kindness gives them a free pass to use drugs and allows them to lose control. Behavioral experiments might also help drive out thoughts that it’s impossible to recover. With imagery exposure, patients bring to mind recent memories that arouse negative feelings. They remember the events and provide sensory details such as what the surroundings looked like. While holding the memories, they try to label what they felt and thought as well as what their behavioral urges were at the time. They might continue to picture the events in detail until their stress levels falls to half of what they were when they started. Exposure to imagery may help make painful memories less likely to trigger self-criticism. It can also reduce evasion so that patients cope in healthier ways. This is one of the cognitive behavioral therapy techniques that researchers are surprised is effective. They say that it’s very helpful for people who suffer from depression. The purpose of this exercise is to stimulate more positive feelings in the daily lives of patients. In one version of this method, patients write a schedule for the following seven days on paper. They must plan at least one healthy activity that they wouldn’t normally do for each day. It might be as simple as eating lunch outside of their office or reading a chapter in a book. The stepped up version of this method is to schedule an additional activity that gives them a sense of accomplishment or mastery. In an advanced version, they schedule a third pleasant activity for each day. Again, these activities must be things that they don’t usually do. This approach to therapy involves patients writing a list of the things that they typically avoid. For each item, they rate the level of distress that they believe they would feel if they did it. The scale usually ranges from zero to 10, with zero showing the least amount of distress and 10 showing the most. The purpose of this list is to get an idea of the severity of an patient’s problems. Starting from the lowest-rated item, they experiment with each one several times for a few days. The goal is to reduce their levels of distress to about half of when they started. They don’t move on to the next list item until they achieve this. Don’t let alcohol or drug addiction take over your life. Beat active addiction by joining a quality rehab center. Call us at 866-319-6126 to get started on your recovery.